I never thought I'd see the day, but it came around quicker than I thought. I've lost about 3lbs, mostly from around my stomach which makes me very happy. Of course we'd all like to loose more, but the number isn't really that important seeing as the results are promising and I can actually see them. Of all the diet shows on TV, I did see a good tip once. Think of a pound of butter or a pound bag of sugar. Visualise it or go to a super market and pick one up. That used to be on you - it's more than you thought! So I'm proud of my 3lbs. There I said it. So would I recommend it? Yes. It's not easy, not diet is. Eating is so habitual that it's always going to be difficult to make a change - especially a drastic one. But there are plenty of flavour options, you're not left starving and if you're really desperate there are particularly tasty snack bars. It's as if they've tried to make it as straightforward as possible. If you have an event, a wedding or you want to kickstart a weightloss regime I think it's just right. That little bit of weight that would be better off gone will go with this diet. Also I found it gave me new motivation to continue on a weightloss program, integrating the leftover shakes for a while with some exercise to shed a few more pounds. Nupo also have a Brick System, they're program for maintaining your weight and watching what you eat. Admittedly when I finished my Nupo diet I kinda relapsed. Then I had a sudden realisation of just how erratic and poor my eating habits were. It was like seeing it objectively for the first and made me realise it was no secret how the weight had crept in. But now I felt like I knew how to tackle it going forward. I think the most difficult part of setting out to loose weight is being discouraged when you're not seeing results. Nupo, I feel, helps you get in the mindset of being mindful of your eating habits and then delivers results that keeps you encouraged. Pros - tasty, filling, doesn't make you feel like your deficient or missing out on anything (Nupo shakes and soups are formulated to deliver 100+% of your daily vitamins and nutrients), you get into good habits about drinking water and saying no to cravings. Cons - you stomach takes a few days to adjust to liquid-only diets, you can get days where you're sick of the shakes and soup, going back to normal food needs to be done slowly or can give you stomach cramps. Sometimes I found it hard to time it so that I had a shake at the ready especially on the go, in which case I wish the meal bars were veggie friendly, but I survived! Would I do it again? Well hopefully I won't have to, but if I needed safe, quick weightloss fix I would have no problem in picking up a few shakes and giving it a go again. You can get Nupo online or in pharmacies, so far I've already noticed it in a pharmacy on George's Street. 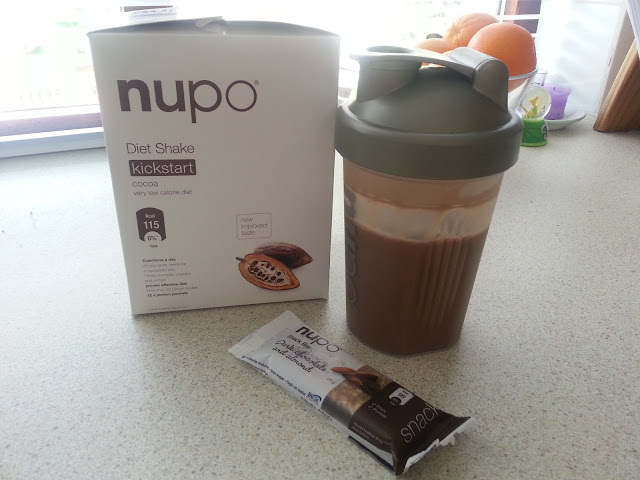 Would you consider trying the Nupo Diet or another rapid weightloss system?